Congratulations to Betty Johnson (Corvallis), who was recently honored with a lifetime achievement award for her contributions to public health. To celebrate, we've posted here our article on Betty and her husband, Francis, from the June 2008 issue of V&B. Enjoy! Drive through the lush and rain-forested city of Corvallis, Oregon, and you’re bound to come across some of the handiwork of Francis and Betty Johnson. Francis, 82, is a master builder, a jack-of-all-trades who has maintained Oregon State University buildings, put up homes, and used his coarse, meaty hands to drag steelhead and sturgeon out of Oregon’s waterways. Betty, 85, is a social servant who has started six nonprofit organizations, written grant proposals and lobbied legislators, working tirelessly so that seniors can live independently in their own homes. Together, the Johnsons are a whirlwind for good, married for 55 years and still rapidly turning. Throughout the Corvallis branch, the Johnsons’ house is known as the Johnson Hotel, where travelers, strangers and families find first-rate food and friends. 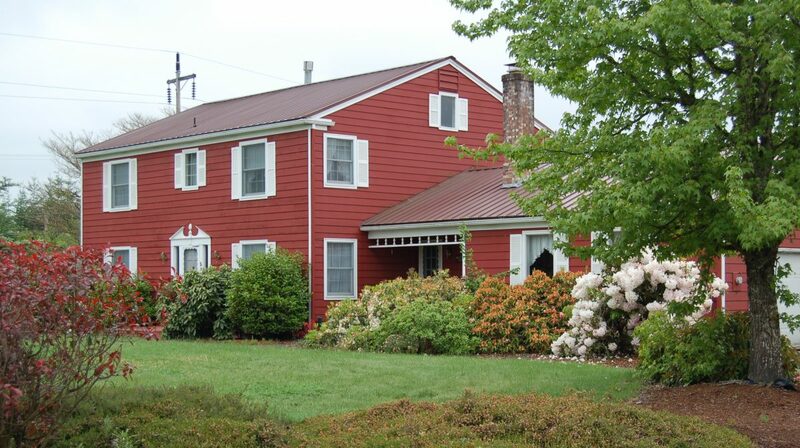 Throughout the Corvallis branch and beyond, the Johnsons’ big, barn-red house is known as the Johnson Hotel. Francis and Betty have welcomed families, transients, students, parish members and community members from Hawaii, New Orleans, Saskatoon and South Bend. A single man stayed with them for two and a half years and a homeless woman moved in one New Year’s Eve, carrying her possessions in eight plastic bags. Their only regret is that they never kept a guest book. For four months in 2001, the Johnsons hosted John and Mary Lou Carey and their three children. The Johnsons and Careys had been neighbors for years, sharing chores and gardens, cars, a well, and even joint ownership of a cow. Betty likes to refer to “the conveyor belt” between their two homes. However, seven years ago that close sharing nearly came to an end. The Careys own a two-story duplex, but health problems had made walking the stairs troublesome for Mary Lou. John tried to come up with ways to expand the main floor so they could live there comfortably, but he couldn’t think of a way to make it work. He was heartbroken at the thought of moving. Then, in the car on the way to a men’s retreat, Francis had an idea. That sketch became the plan. Later that day, Francis pulled John aside. John and Mary Lou moved into the Johnsons’ living room, stretching a sheet across the doorway for some privacy. Before and after John’s workdays at Hewlett-Packard, he and Francis worked on the house. The Johnsons moved to Corvallis from Kansas City, Missouri, in 1970, carrying their four children along with them. They wanted to leave the big city behind, choosing Corvallis because it was close to water, close to a university (Oregon State) and within reach of classical music and opera venues in Portland. They bought a Coast to Coast hardware store and started attending St. Mary’s, the only Catholic Church in town. One Sunday, they missed morning mass and instead went to an evening student mass, where Fr. Charlie Harris was preaching. The Johnsons enjoyed Charlie’s preaching, but they didn’t go to the charismatic prayer meetings he was leading at their parish. Then one day in 1976, they attended a fortuitous outdoor birthday party with some of the prayer meeting folks. 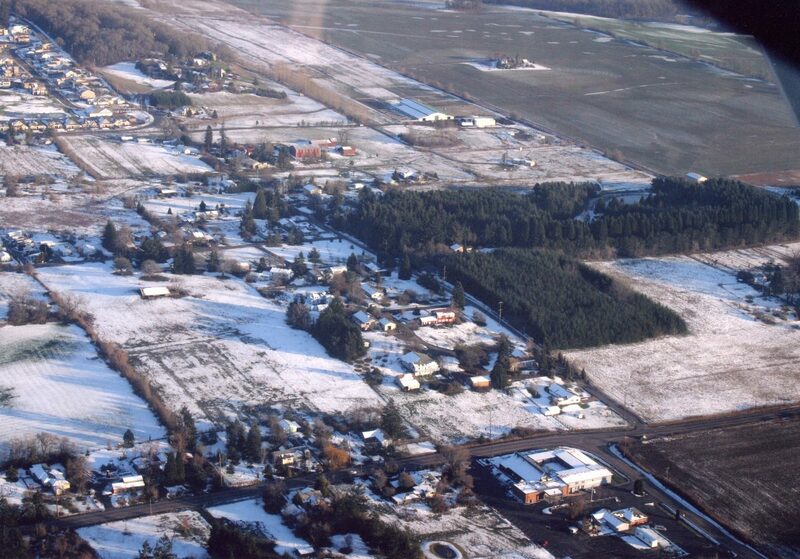 In the late 1970s, Francis Johnson and other Corvallis branch handymen such as Terry Hackenbruck and Chris Taylor helped build Christian Village, a cluster of 10 homes on some former farmland just outside Corvallis. They started in 1977. Charlie Harris, the Johnsons, Hackenbrucks, Nathmans, Taylors, Wagners and a few other families bought 12 acres of rolling farmland together, just beyond the Corvallis city limits. They planned to build houses and live close together, calling this proto-city-building effort Christian Village. Many of the men were contractors or skilled workers who put up their own houses and helped one another along the way. Francis remembers a roofing party that involved 22 men and boys, beginning 8:00 a.m. and ending at noon with a completed roof. 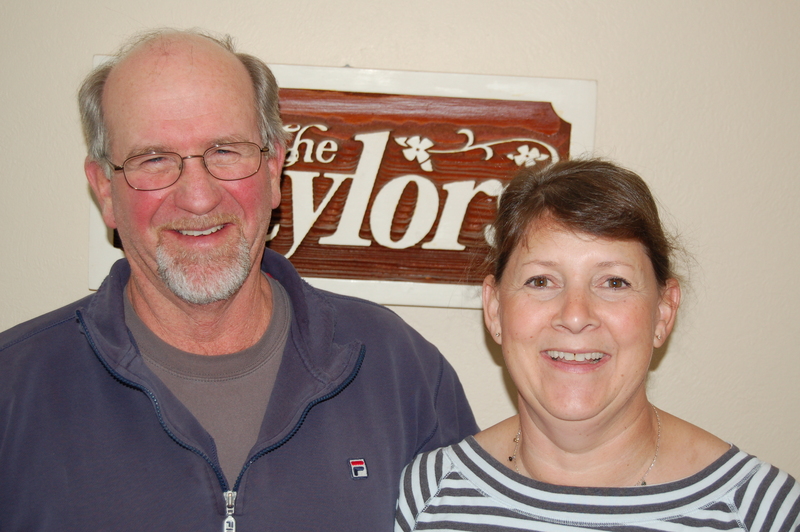 Francis and Chris Taylor started Christian Construction Company together with Ted and Chris’s brother Frank. 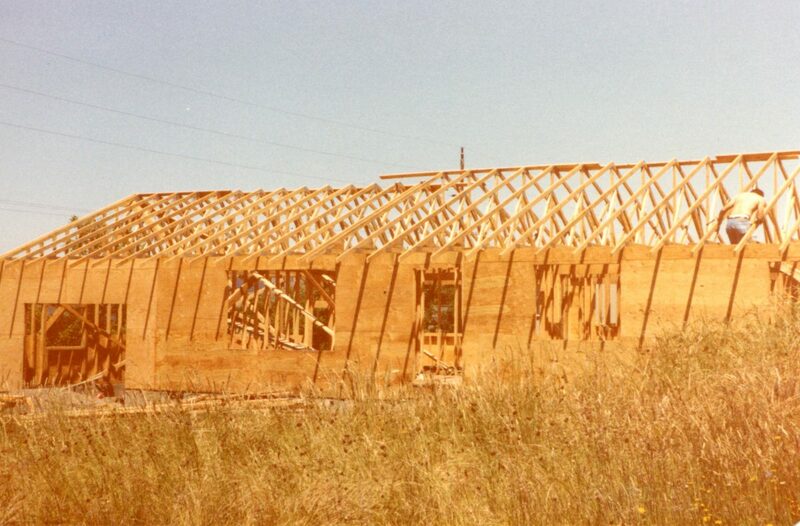 The company oversaw construction of five out of 10 Christian Village houses and then went on to build more homes around Corvallis. Christian Village from the air. The Johnsons’ home is the red building in the center. Fr. Charlie Harris moved into Christian Village in 1977, taking up residence in an old farmhouse next door to the Johnsons. He and Francis grew to be friends, fishing and gardening together and even learning to keep bees. The Johnsons and Charlie celebrated anniversaries and birthdays together with pies and home-cooked meals, and did so until his death in 1988. “He and I were close brothers,” Francis says. When the Johnsons were running their hardware store, Betty felt like a fish out of water. She says she resigned from the job because she “couldn’t tell one kind of paint from another.” In 1972, she got a job as the director of the Area Agency on Aging, developing services for senior citizens in three counties. “When I started, there was almost nothing available for older people in health and social services,” she remembers. She drafted a plan for a senior meals program and helped start a transportation service called Dial-A-Bus. Later, she and others organized one of the first Hospice chapters in the state, providing home health care for many. All three programs are still going strong. Betty and Francis have expanded that effort since their retirements in 1987. Betty helped start Volunteer Interfaith Caregivers in 1986 and still directs the organization. The board is actively trying to replace her, but they can’t find anyone to take on her load. The 200 or so volunteers she coordinates visit elderly residents in their homes, take them grocery shopping, drive them to medical appointments and even build wheelchair ramps for them. 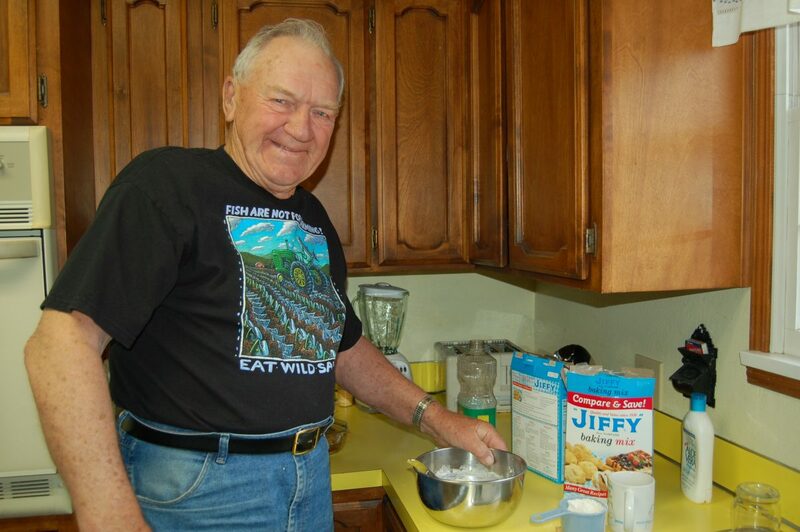 Francis oversaw the construction of more than 50 wheelchair ramps in 2007 alone, leading crews of retired men who call him “Boss” and like to eat the cookies he bakes on their breaks. Francis Johnson supervised the construction of more than 50 wheelchair ramps in 2007. 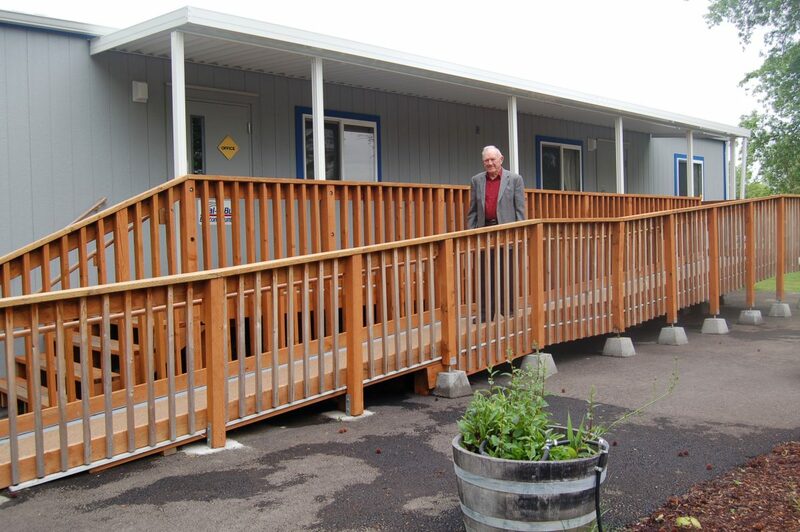 Together Betty, Francis and others dreamed up, promoted, fundraised for and, in 2002, finished building Corvallis Caring Place, an assisted-living center for 42 residents. Francis served on the board until recently, and Betty is still a board member. 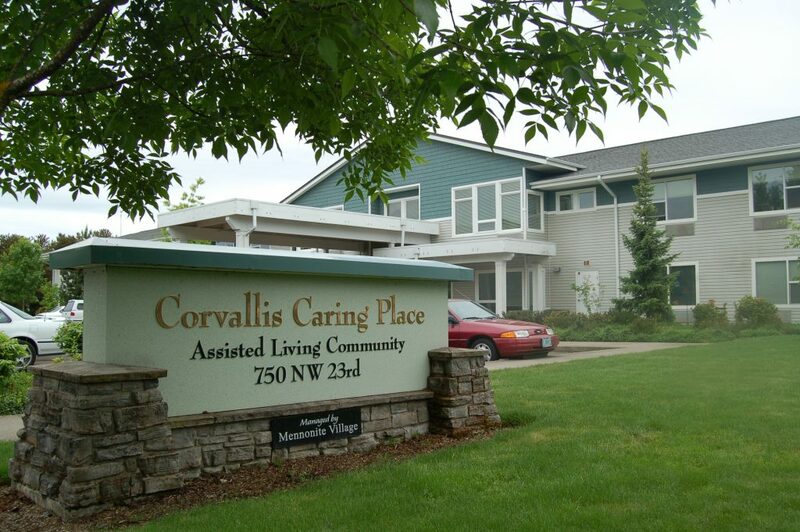 Caring Place is the only assisted-living facility in Corvallis that accepts residents on Medicaid, but it doesn’t look or feel institutional. 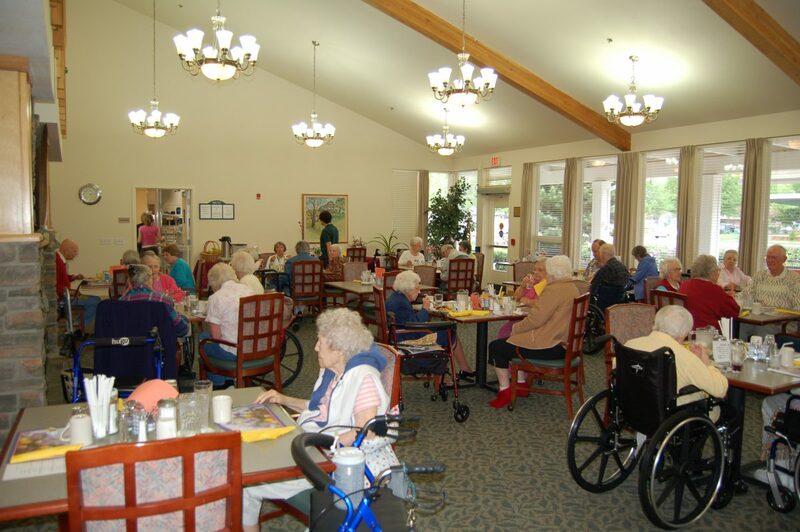 Residents sit around chatting cheerily in the large, naturally lit dining room. They get their hair done in the beauty salon and tend flowers in the garden. 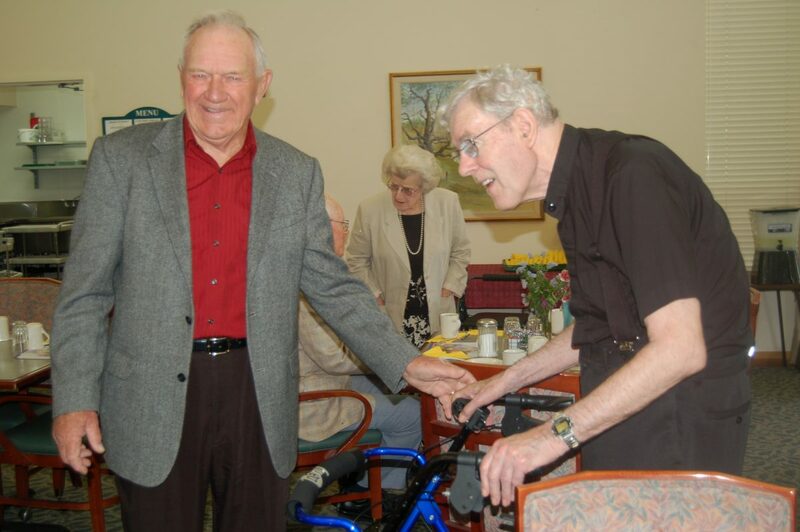 Francis (left) and Betty (in back) with residents at Corvallis Caring Place, an assisted-living center they helped build in 2002. Betty’s work with seniors got her interested in health-care reform. 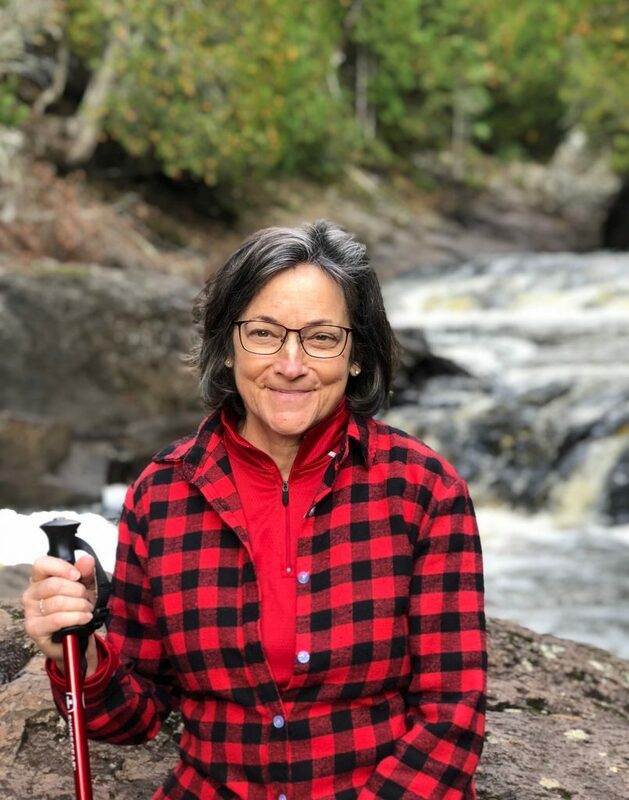 In 1991, she started Mid-Valley Health Care Advocates to work to bring health insurance and high-quality health care to the 600,000 Oregonians who are uninsured. Today she travels regularly to Salem and Portland to meet with other advocates. She’s on a committee that’s drafting sections of a health-care reform bill they hope will go before the Oregon legislature in 2009. Though Francis is less active now—he suffers from chronic headaches—Betty still volunteers 50 hours a week. Her schedule is a tour de force: on a recent Tuesday at 5:00 p.m. she found out that she was expected to give a presentation on health-care reform the very next day in Portland. That evening, she stayed up talking to Francis until 10:30, and then began typing her presentation, finishing up around 2:00 a.m. The next morning, she traveled 90 miles to Portland, gave her presentation, and came back in time to welcome houseguests. Betty’s activities bring about 20 emails each day. She responds to most of them, checking her messages throughout the day, even just before bed. 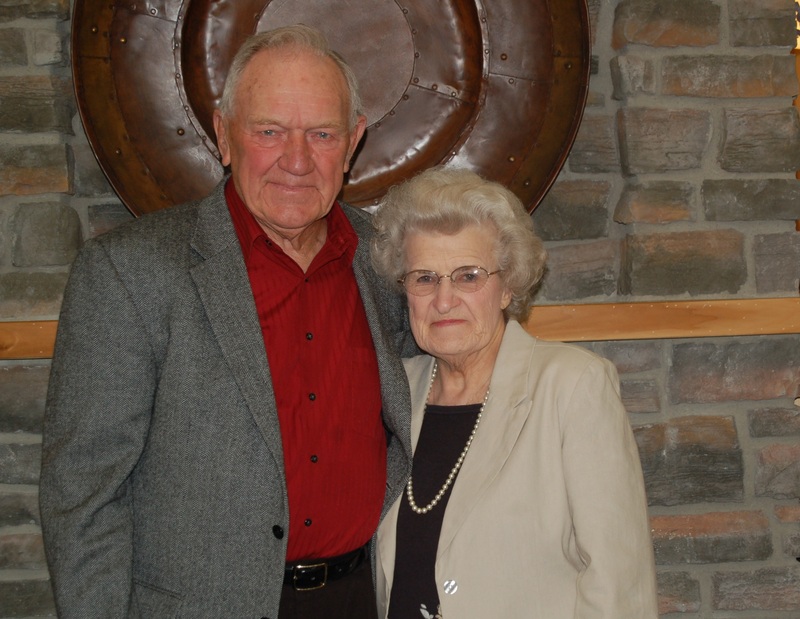 Fifty-five years into their marriage, Francis and Betty are still very much in love. Late in the evenings, you can find them playing dominoes together at the dining room table or sitting on the sofa eating popcorn and cookies, surrounded by Francis’s fishing posters. “Some people ask us if we ever had a second honeymoon,” says Francis chuckling. “We’re still living off of our first.” Of course, they worry about each other—Francis about Betty’s frenetic pace, Betty about Francis’s headaches. What an heroic love story! What an example of covenant love spilling out to so many in need. 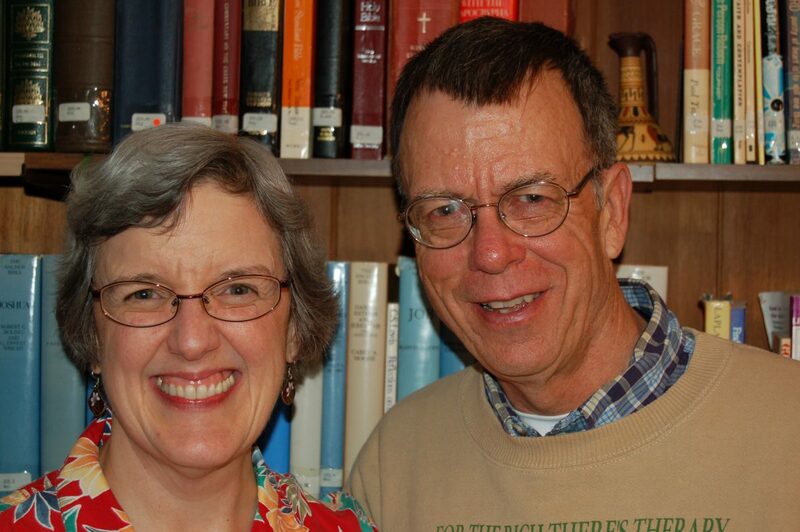 Francis and Betty hosted us more than once on trips to Corvallis and we honor them both for their faithful service to God's people . Thank you, Betty, for going the extra mile for the Lord's poor over a lifetime. Betty, you certainly deserved the Lifetime Achievement Award! I felt honored to work with you in the Volunteer Interfaith Caregivers development of a poster board. You ran my legs off, getting those photographs!